Airing My Laundry, One Post At A Time...: Inside Natalie's Closet: Halloween Outfits! 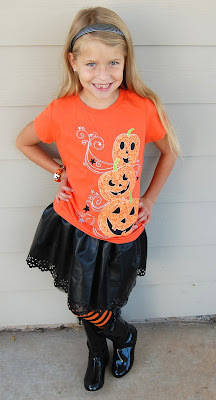 Inside Natalie's Closet: Halloween Outfits! Naturally I had to get some Halloween themed outfits for Natalie. This is from The Children's Place. 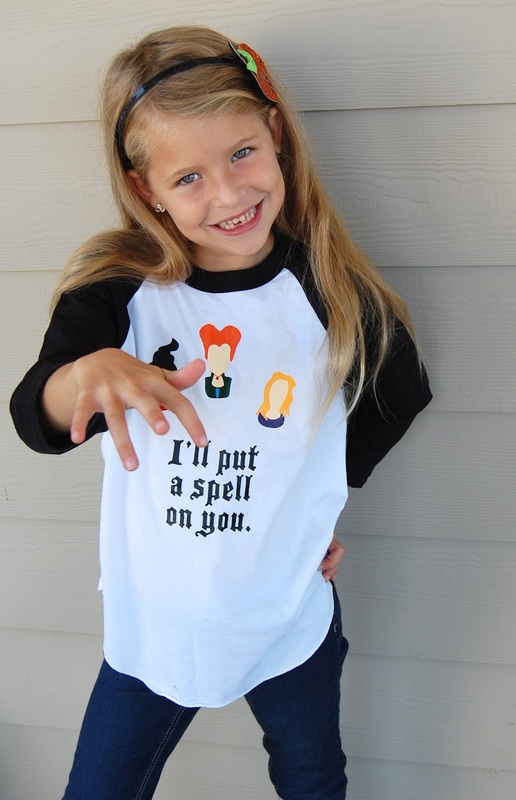 The shirt speaks the truth for Natalie. She inherited my love for candy. Especially candy corn. But really, she prefers fruit. "What if I did the splits RIGHT NOW?" I replied, "I wish you wouldn't. I don't want your pants to split." She didn't go all the way. She also was worried her pants would split. And then she freaked out when she saw Beetlejuice's grave. "I won't say his name three times. I don't want him to come here. He won't help. 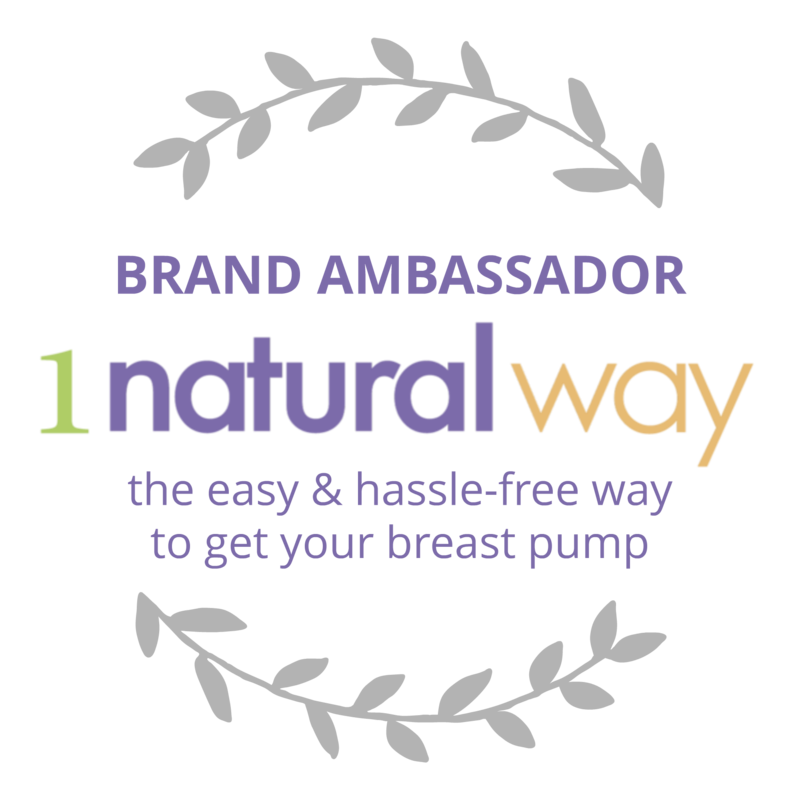 He'll only mess things up," Natalie told me seriously. The top and skirt at from The Children's Place. The tights are from Target. The boots are from Gymboree. 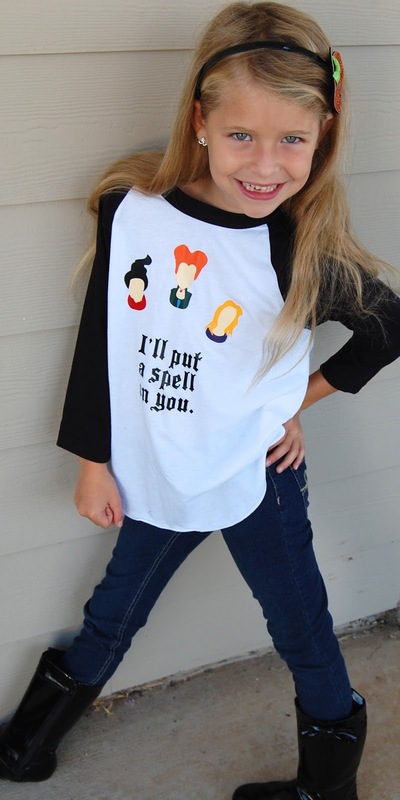 Who loves the movie Hocus Pocus? We do! So I had to get this shirt. If you want your own, you can get it from the Etsy store Threeckreations. She was making a face like Winifred. She cracked up when I started quacking. I said her spell must've turned me into a duck for a brief moment. 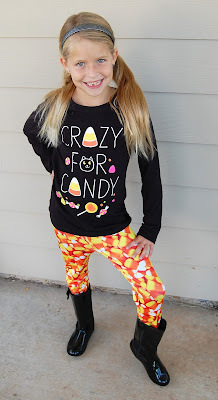 Do you wear Halloween themed clothes? Or do you buy some for your kids? She is so spunky and cute!! We got quite a few hand-me-down Halloween shirts. Benjamin is reaping the greatest benefit this year, but they're all excited to wear them. Last year I got them out too late! I thought the candy corn pants were my favorite thing ever, but the Hocus Pocus shirt is high up there. Also, can I still get away with clothes like this? I mean, I'm in my 30's.. I'm a mom.. but I still have my metabolism and long hair. 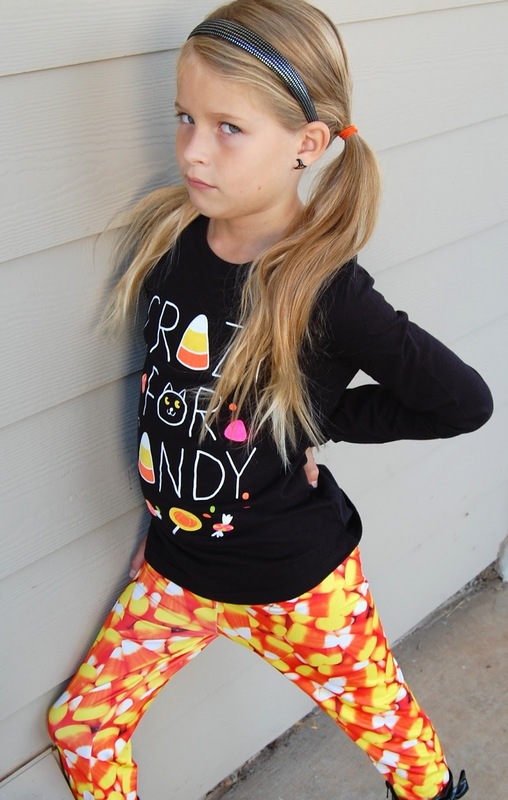 I'm wondering if I'm yet at the age in which candy corn pants would look kooky on me.. but like crazy cat lady kooky. Or.. if it might be "cool." All so cute! The leggings are my favorite. 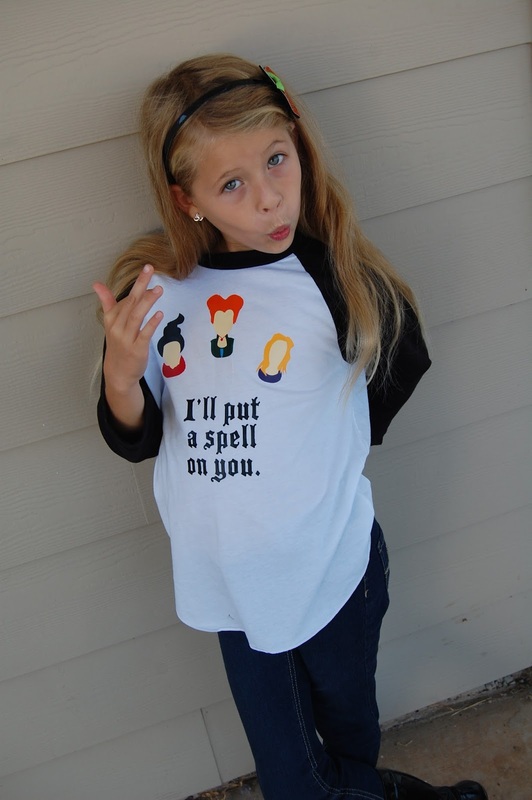 And the Hocus Pocus tee is awesome! Super cute! My 7 year old has a pair of candy corn pants! She loves them! I love love love the tights with the stripes!! Love them!!! The outfits are amazing!!! I love everything Halloween!!!! I do have a few halloween themed shirts that I wear this month - I love the Hocus Pocus shirt! So cute! She is adorable! I love Halloween clothes. Weirdly enough, I get a ton of Halloween underwear and socks. I know. Totally strange. She looks so cute and I love all things Halloween, so yes to the themed clothes. 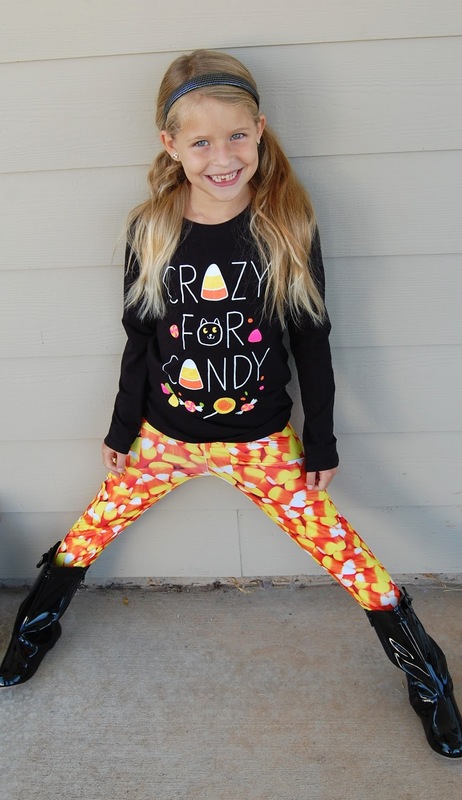 Those candy corn leggings are amazing! love the candy corn leggings and the Hocos Pocus shirt. That is one of my favorite movies. such a cutie! 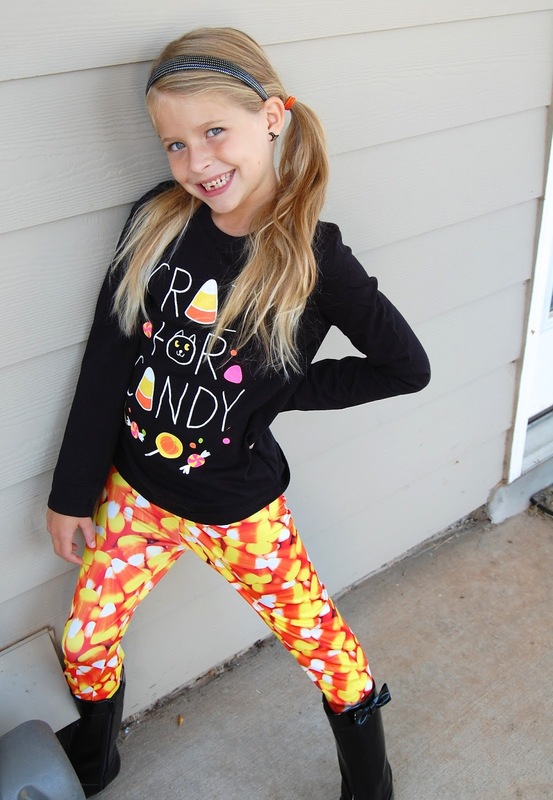 i want those candy cornleggings for MYSELF! I LOVE these all so much and can't wait until my daughter is a little older so I can dress her in all the fun Halloween stuff! Adorable!